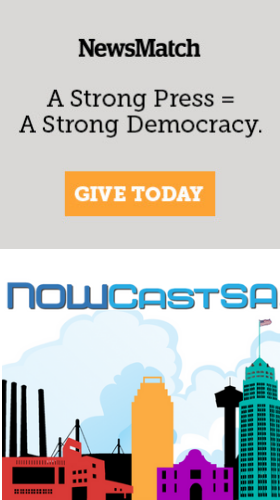 In my capacity as the Managing Director of NOWCastSA, I took the unusual move today of unpublishing video of the Alamo Heights Neighborhood Association Election Forum webcast while we edit and correct the identifications of speakers in the video. I apologize again for the miscommunication between me and my staff that led to your last name appearing incorrectly in the lower thirds of the video during much of the AHNA candidates' forum. I need to explain how that happened and why I've reluctantly decided to unpublish the video of the AHNA forum for now. You know that I take errors very seriously, which is why I came down to the stage the minute the forum ended Wednesday night to acknowledge the botched ID problem and to apologize to you personally. I also offered my sincere apology to your wife, Susanne. I was grateful when each of you accepted my apology very graciously by saying the ID under the name was not as important as the ideas expressed during the forum. Ironically, I didn't immediately notice the problem with your name in the webcast because I spent much of the evening focused on trying to help AHNA Webmaster Steven Arsena embed the video on the AHNA website. After getting no response from Steven to the last of my emails sent at 8:21 p.m., I turned my entire attention back to the webcast of the forum and saw the problem with your name. That's when we fixed the "lower third ID" as they are called in the broadcast business. Before the event, as soon as the name cards were placed on the tables on stage, I had a NOWCastSA editor on the floor shout the lineup up to me so I could scribble a "left-to-right map" of the speakers to our video producer who was set up in the balcony. We do these impromptu maps to help the video producer get the right "lower third IDs" under people's faces during the live event. It's quite a challenge when we're not well acquainted with the speakers to get the right names under the right faces. My notes on that map show that I scribbled Cooper-Thompson after your first name, because that's what I thought I heard our editor on the floor say. My own unfamiliarity with the names meant I didn't immediately recognize my mistake. Sadly, our video producer typed the "lower third IDs" into the TriCaster using my scribbles on that map, rather than the AHNA Election Guide that I had given him to use. My bad again, for not immediately proofing his lower third IDs as I usually do. I won't call this a simple screw-up, but it was not any more complicated than I just described. There certainly was no malice and no intent to do harm. During the event, there may well have been instances when our video producer inadvertently activated the wrong ID under a person's face. In a live production, that happens in exactly the same manner as when the moderator misspeaks and then corrects himself, or when a violinist misses a note during a performance. We are all imperfect humans. After each of our live webcasts, the video is "auto-archived" for replay exactly as it went up. We've always left the video up as a service to community members who were not able to attend the event in person or online. People are extremely grateful to be able to see video of the event, exactly as it happened. I'm very alarmed at the theories and motivations that are being applied and ascribed to our screw-up, despite my immediate insertion that night of a correction and apology in front of the video. After weighing the matter, I've decided to unpublish the video while we fix it. Sadly, by unpublishing the video now, we do a huge disservice to the people in the community who can look beyond a botched ID and really listen to what the speakers have to say about the important issues facing Alamo Heights. Fixing the IDs on the video is not simple, because we cannot edit what is up on the Web. We must start from scratch with the video saved on the TriCaster's hard drive. Given the demands on our small staff's time, it's hard to predict when we be able to finish editing and reposting the video. I'm concerned that removing the video without explanation could launch yet another round of fantastic theories, so I am compelled to publish this entire explanation on NOWCastSA even as I unpublish the video. Once again, I want you to know that I truly apologize for the error and I regret that others are not as accepting as you and Susanne.